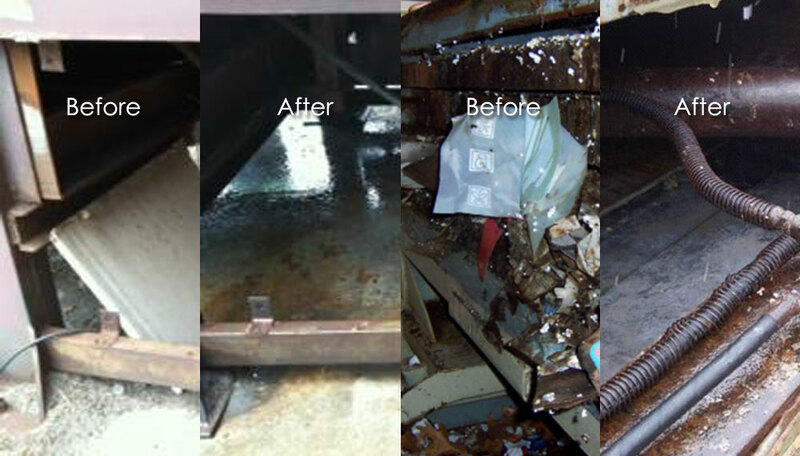 When it comes to trash compactors - maintaining first-class cleanliness can be a BIG job and an important one. Poorly-maintained trash areas affect a lot more than your image – they can be breeding grounds for pests, bacteria, and harmful contaminants. 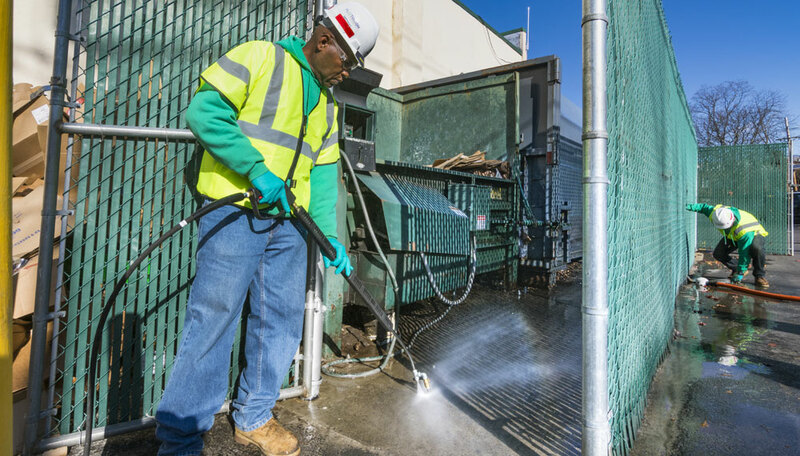 FLEETWASH can help you tame the trash tiger, lengthen the life of your compactor, AND help you maintain a professional image to your facility employees and guests. 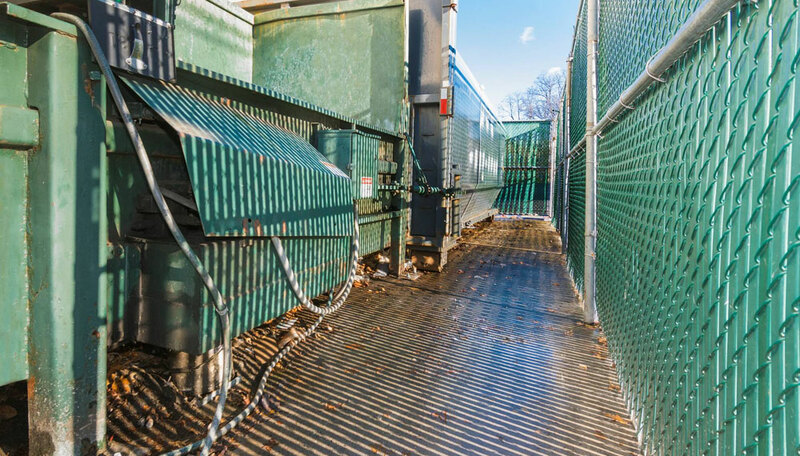 FLEETWASH services compactors across the country – Pit-style Stationary Compactors, Exterior Stationary Compactors, and Self-Contained Compactors. We have the experience, expertise, and professionalism you can count on. PLUS you can rest assured your job is completed to EPA standards and in an environmentally sustainable way – we guarantee it. Last year alone FLEETWASH serviced over 100,000 trash compactors, more than 100,000 Solar Panels, over 100,000 HVAC and refrigeration units….and countless buildings, awnings, and sidewalks. FLEETWASH services three main types of compactors: Pit-style Stationary Compactors, Exterior Stationary Compactors, and Self-Contained Compactors. 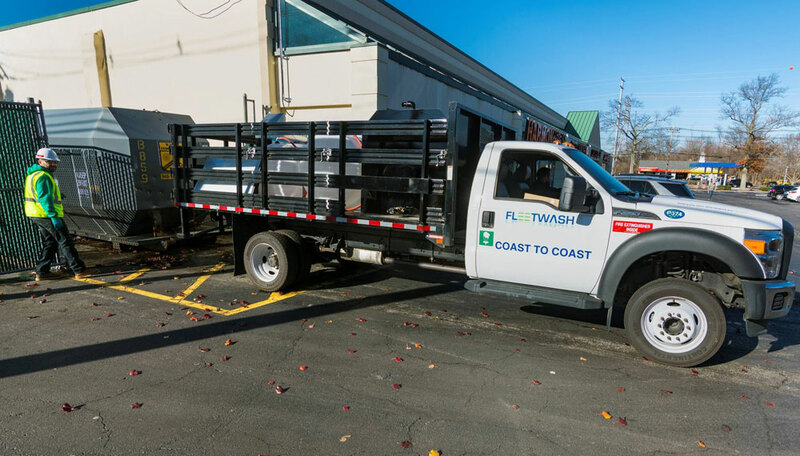 FLEETWASH Professional crew will park the water recovery and power-washing vehicles near rear entrance away from the front of the store and store customers. FLEETWASH crew leader always speaks with the Store or Facility Manager to confirm the scheduled servicing, explain the entire cleaning process and formerly document the number of FLEETWASH crew members and official start time for each work order. FLEETWASH will bring all material and supplies to the compactor area including several lengths of pressure hose and vacuum hose. The FLEETWASH crew will also “Lock Out” the trash compactor to the “off” position before cleaning the compactor. 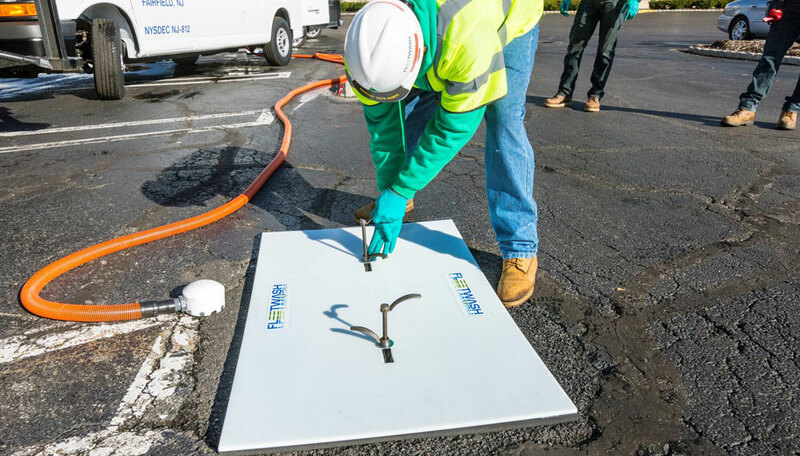 FLEETWASH will use their patent-protected drain covers and water recovery system to seal all drains in the area to prevent the unintended run-off of wastewater. All wastewater will be collected, contained, and removed from the premises. FLEETWASH will undo the Turnbuckle to the compactor unit, chain the compactor to our FLEETWASH vehicle, and pull the unit out. FLEETWASH crew will then inspect the compactor for any damage and assess the need for any repairs. FLEETWASH then begins the cleaning process by sweeping away heavy dirt and debris. FLEETWASH then uses a hot biodegradable cleaner and disinfectant on site and brush-scrub the compactor unit. FLEETWASH will hot-rinse compactor and surrounding compactor pad area thoroughly until a CLEAR flow of water is coming from the compactor area, collecting and recovering all wastewater in the process. FLEETWASH then pushes the unit back, puts turnbuckle back on, greases all fittings and turns the unit back on. A full cycle is run to ensure the unit is working properly. FLEETWASH crew leader then talks with the store or facility manager once again to report any problems or concerns with the compactor unit and will assist them in inspecting the trash compactor before the job is considered complete. Companies are under increased pressure from State, Federal, and Local authorities to comply with regulations concerning sustainable cleaning and washing. Regulations have been put in place to prevent or limit contaminants from entering drains and water systems. 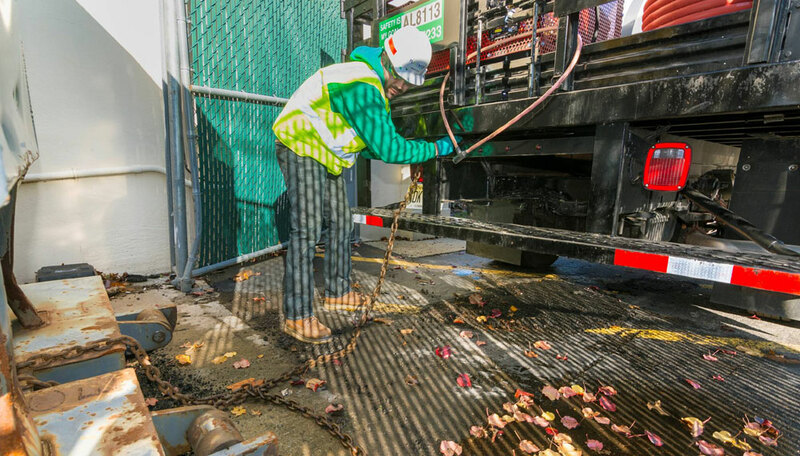 Wastewater is an even larger concern when dealing with parking lots, loading docks, trash compactors, and transportation vehicles where oil, grim, harmful chemicals and corrosive materials are in the effluent wash water. In these cases, runoff can affect the surrounding environment and its ecosystem. Facility managers understand the need for clean building exteriors and interiors. Not only does a clean facility positively impact your brand but it limits your liability. 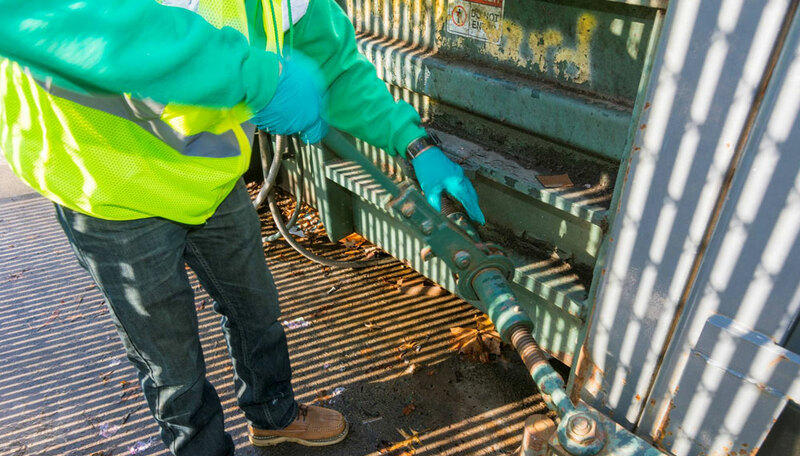 Cleaner trash compactors limit employee exposure to germs or biohazards, increase the efficiency of the compactor and extends the life of your garbage equipment. Regularly scheduled cleaning and maintenance protect your company’s investments. FLEETWASH has been the leading innovator in mobile, environmentally-friendly and sustainable power washing for more than 40 years. That’s why companies nationwide rely on FLEETWASH. …hook a chain to our FLEETWASH vehicle and pull the unit out. FLEETWASH crew will then inspect the unit for any damage and assess the need for any repairs. FLEETWASH will hot-rinse the compactor and surrounding compactor pad area thoroughly until a CLEAR flow of water is coming from the compactor area, collecting and recovering all wastewater in the process. FLEETWASH pushes the compactor back, puts turnbuckle back on, greases all fittings, turns the unit back on and runs a full cycle to ensure the unit is working properly. All work is inspected by store manager before completion. FLEETWASH talks with the facility manager and inspects the compactor unit and will discuss any problems or concerns with the compactor. Your satisfaction is guaranteed. FLEETWASH isolates, collects, transports, and properly disposes of all wash water run-off through their patent-protected water recovery system. FLEETWASH holds licenses and permits from over 50 cities in states around the country and is certified by your State and Local Environment Agencies. FLEETWASH assumes all risks and liabilities for proper water isolation, collection, transportation and disposal of your waste water in compliance with your Local, State, and Federal regulations.